I regret to report that Bernard Perlin died on Tuesday 14 January 2014. Perlin and his art came to my attention when I was doing research on Edward John Stevens, Jr. Both artists were included in a 1950 Life Magazine article titled Nineteen Young American Artists. After acquiring a work by Perlin I contacted him and visited him at his beautiful home in Ridgefield, Connecticut, where he painted, grew pelargoniums in a glasshouse and enjoyed the company of wild turkeys and any other fauna that walked by his window. I subsequently acquired more work by the artist and eventually wrote an article on him that was published in 2012 in Fine Art Connoisseur magazine. Please contact me if you would like a pdf of the article. I also collaborated with Michael Schrieber in creating a website dedicated to the artist. Bernard Perlin was a beautiful, humble, sophisticated person. 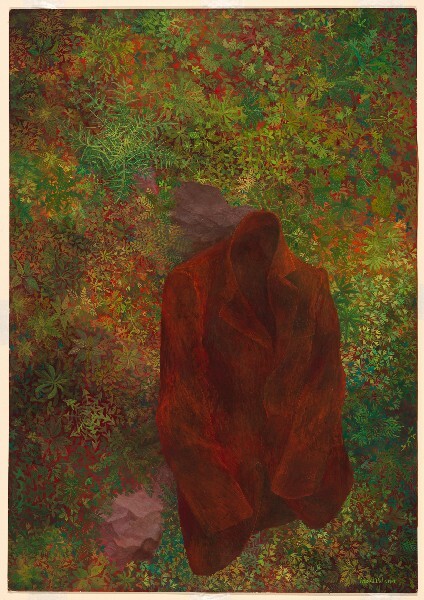 His painting "The Jacket" (shown here) is in the collection of the Whitney Museum of American Art.